We've scoured 16 counties for the most gorgeous romantic couples stays, so you can put some oh-la-la into your leisure time. Looking to rekindle the fires? Stoke the iron of hot-rod passion? Er, get away from the kids and sleep for 14 hours solid? Then this is the feature for you. The most romantic stays across 16 counties and all in the name of love. A naughty break always manages to inject a bit humour and harmony back in a relationship – especially when it involves lots of food and drink in a bucolic paradise. It doesn’t get more idyllic than Bray, so look no further for your bolthole than Bray Cottages. There are three properties to choose from, each one unique, beautifully styled and within staggering distance of Heston Blumenthal’s Fat Duck, Hinds Head and The Crown, the Roux’s Waterside Inn and Caldesi de Campagna. 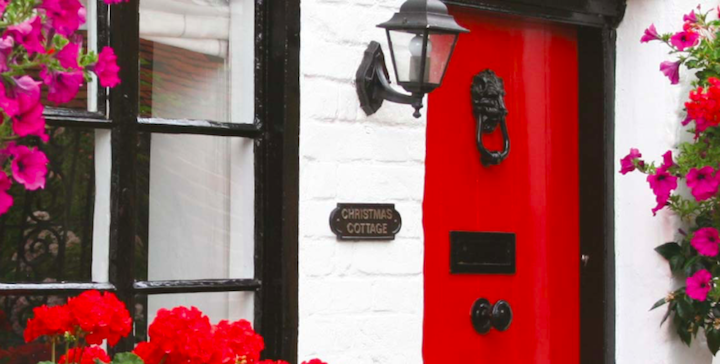 My personal favourite is Christmas Cottage (£350 per night) for its funky interiors, Missoni bed and courtyard garden. A concierge service is available too, so reservations to the culinary crown jewels can be made, boat trips down the Thames, spa treatments and picnic baskets. Dogs welcome. A hidden gem in the West Berkshire village of Hampstead Norreys, the recently renovated Manor Courtyard Cottages were originally the old dairy and stable block of the Manor House but are now modern rustic hideaways. 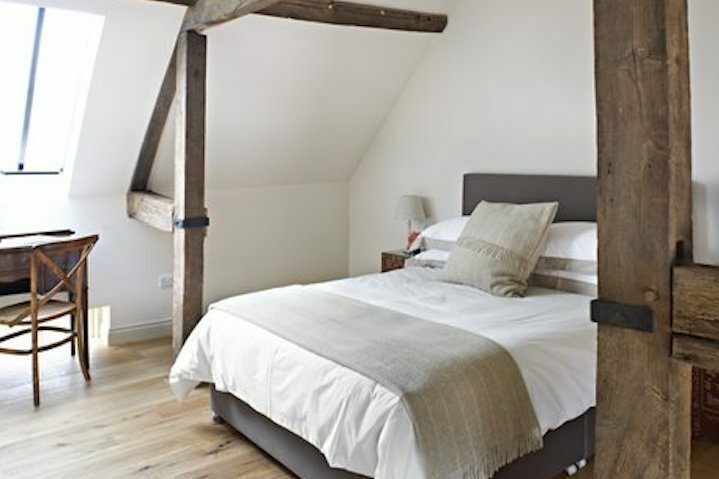 There are two 2-bedroom properties to choose from, but Pear Tree is pretty special with its exposed beams, luxury bathroom and Victorian walled garden. You’re perfectly placed for walks on The Ridgeway or a day at Newbury races and the White Hart is just across the road for good pub food. Pear Tree Cottage is available from £110 per night (2-night min) or from £650 per week. No pets. 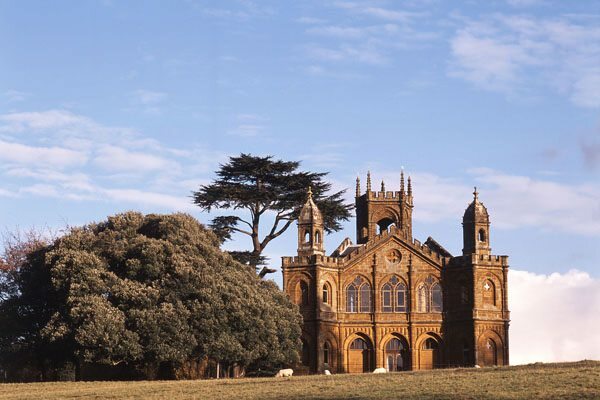 This Temple, built in 1741, is one of the last additions to the garden at Stowe near Buckingham, and its gives good romance, perched at the top of the Capability Brown landscape in one of the finest gardens in England. Inside the rooms are all circular with the main vault of the central space a stunning whirl of colour and gilded heraldry. Exhibitionists will enjoy the fact that National Trust visitors to Stowe can come fairly close to the house so close your curtains – or not! Sleeps 4. If you’re seeking a little love-nest for a few days then The Old Diary and Buttery, set in the stunning grounds of historic Eye Hall (once owned by Henry VIII), are luxurious romantic retreats. Each property sleeps two with an open plan living area, well-equipped kitchen and dining area, plus secluded garden area with tables, chairs and sun-loungers. Next door you’ll find a double bedroom and ensuite bathroom – The Old Diary is the slightly larger of the two and has a separate bath and shower. 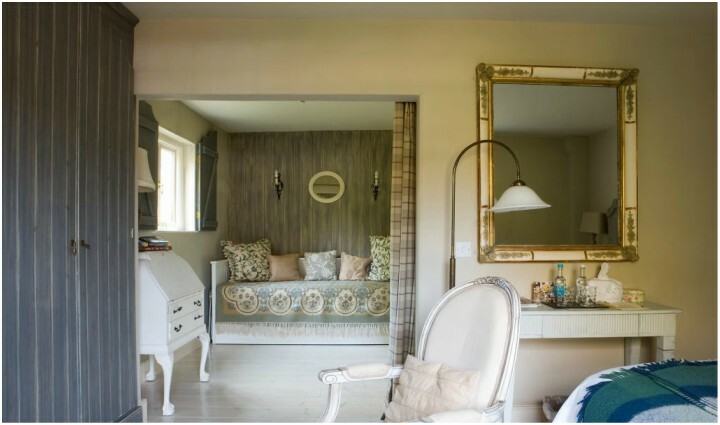 The cottages have been lovingly restored with a creative mix of old and new; you’ll find reclaimed brick floors and timbers, antique finds, vintage upcycling, eclectic mirrors and the odd statement chair. 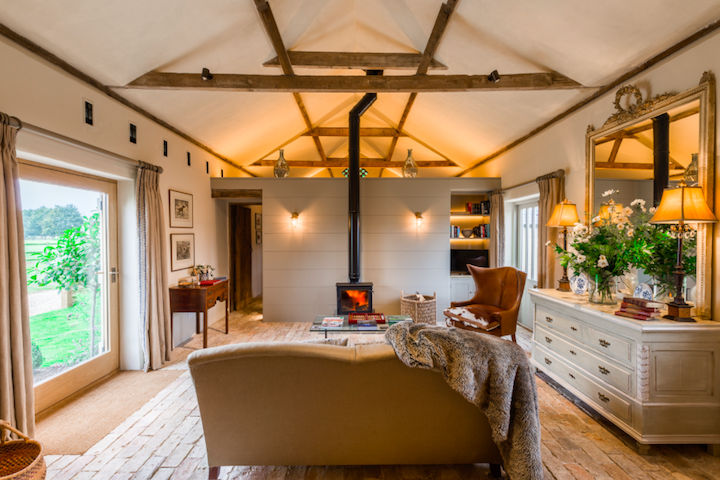 Luxury seeps out of every nook and cranny – woodburners with heaps of wood, top-notch mattresses, contemporary kitchen and bath fittings, Jo Malone in the bathroom and an honesty bar with a lemon and ice waiting for your first G&T. 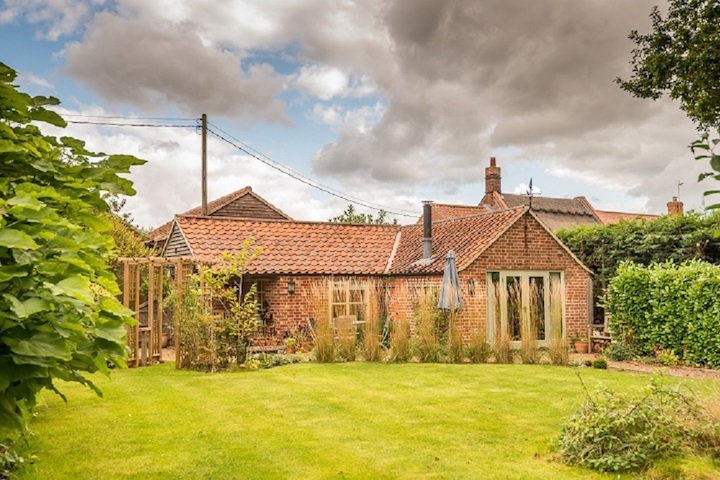 The cottages are only a few miles from Cambridge and Newmarket and with the wedding season fast approaching they make a great alternative to a hotel. Cambridge is a romantic melting pot of beautiful architecture, the arts, food and drink so where better to soak it all up for a few days than the affectionately named, Mrs Andrews. This good-looking little Victorian end of terrace is the perfect home from home slap bang in the centre of Cambridge. It’s been lovingly restored maintaining its period features but creating a light and airy space. The elegant and grown up main room downstairs has stripped wooden floorboards, comfy sofas, antique furniture and an eclectic array of art on the walls. There’s a small but perfectly formed kitchen with a door leading to a little courtyard – perfect for a morning coffee in the sun. Upstairs you’ll find two good-sized double bedrooms and a bathroom. Ditch the car – there’s off road parking which is darn hard to come by in Cambridge – the joy of Mrs Andrews is that you can walk pretty much everywhere and if you want to rock it like a local, jump on a bike. It’s hotting up in the city and whether you bond over music festivals, art exhibitions or gastro events, there’s heaps to enjoy. A punt along The Backs is a must for anyone visiting Cambridge and Mrs Andrews includes a chance to explore the city by water if you book between now and 30 Sept.
A chic little cabin with massive views, The Edge is set in a cliff top location looking down towards Whitsand Bay and the nearby coastline. 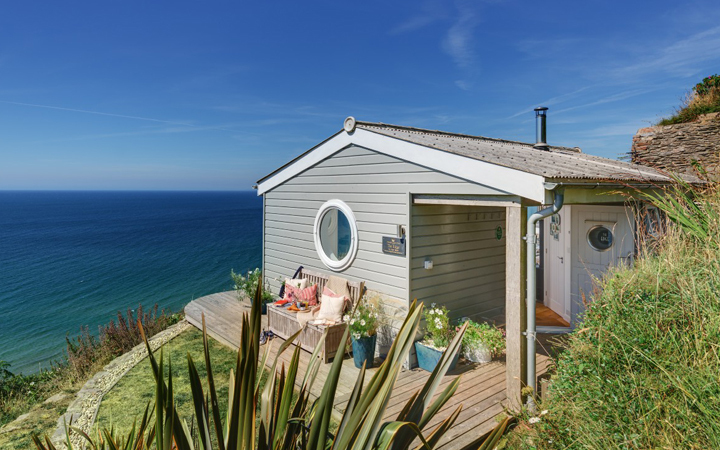 This cedar-clad eco-lodge is inspired by Cornish beach huts but a whole lot more luxurious, with stylish interiors and a perfect dolphin-spotting deck, complete with a hot tub and a path that leads directly to the beach below. Mousehole was famously named ‘the prettiest village in England’ by Dylan Thomas and it’s a firm Muddy favourite. 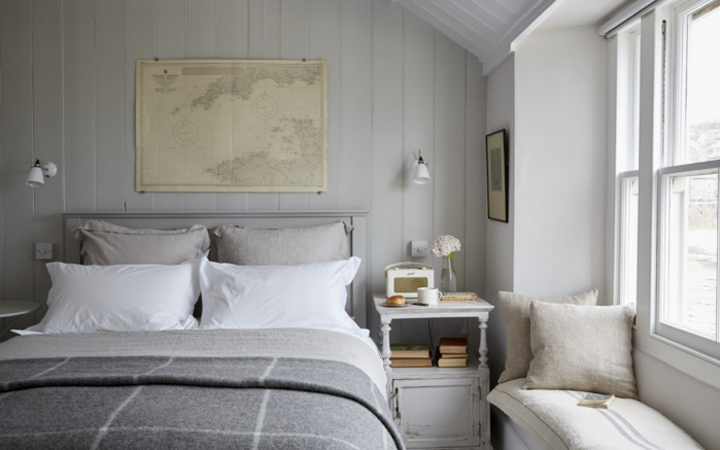 This stylishly rustic harbourside cottage – a former net loft – is the perfect romantic bolthole from which to explore it. Cladded walls, white washed floorboards and serene neutral interiors are a refined take on coastal style. Stroll around the village, stop into the many galleries and definitely book a table for dinner at The Old Coastguard. Fancy a cosy night or two under thatch? 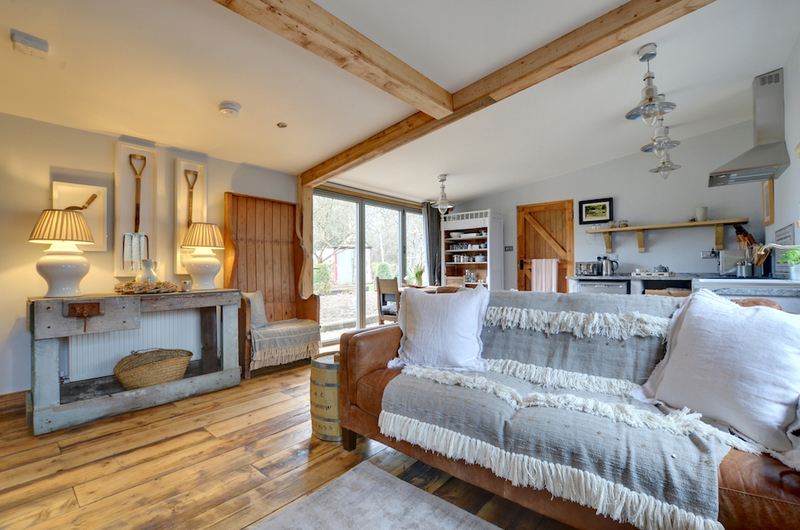 Head for the Hills and check into The Barn, a chocolate box one-bedroom conversion with views of the Blackdown Hills and stunning Devon countryside wherever you look. This beaut of a cottage in the charming village of Cotleigh, near Honiton in East Devon nails style and puts the haven in hideaway. 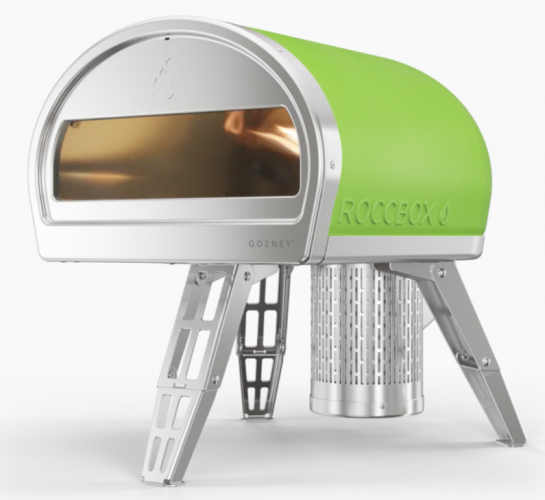 It’s perfectly suited to the city dweller who yearns for fresh air, but wishes they could take all of their home comforts with them. Take a long hot soak in the vintage roll-top bathtub, complete with luxe Bamford goodies, stoke a roaring fire in the winter months and cook up a feast in the cutting edge kitchen (plenty of farm shops nearby for good quality produce). 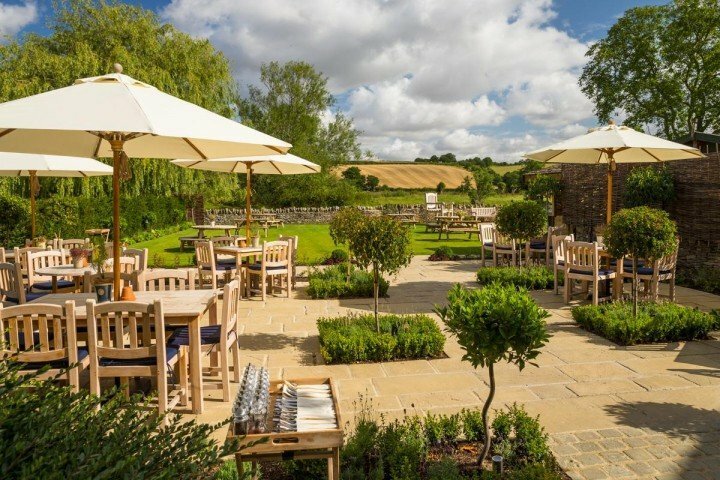 If you find yourself craving civilisation and fresh air, then you’re close to pubs, country walks from your doorstep, as well as the East Devon Jurassic Coastline; and you’re not a million miles from the gorgeous Pig Hotel at Combe, either, for dinner, drinks and an extra dose of country glamour. 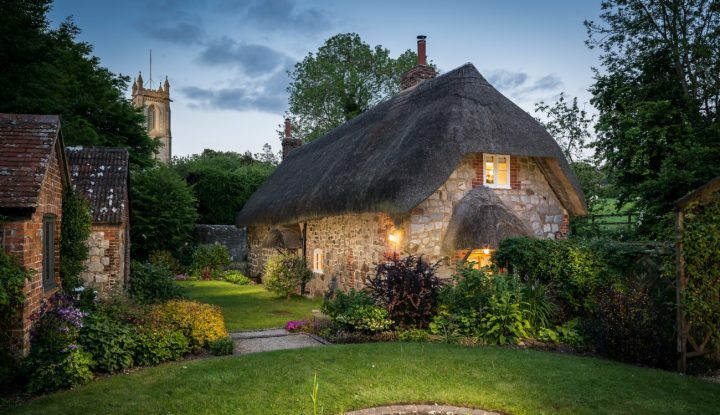 This picture-perfect, thatched 16th-century cottage in the heart of England’s answer to Tuscany may look chocolate-box pretty, but I reckon it has the potential for a damned fine dirty weekend for two, as there’s something rather thrilling about serving up a bit of naughty with nice. And there’s plenty of nice to be had – an open-plan ground floor with inglenook fireplace, log burner, purple velvet sofas and cosy kitchen, a sprawling garden with cushioned wicker furniture to curl up in together with a bottle of rosé and admire the view of uninterrupted rolling green countryside (you’re down a small country lane, so you’re totally touts seuls or toutes seules, whatever floats your boat) and upstairs in the very romantic-looking bedroom there’s a fancy wrought-iron bed, a chandelier, lots of oak beams and a roll-top bath. Just add naughtiness. If you feel like letting your Dangerous Liaisons-style fantasies run wild, then this studio apartment on the ground floor of this elegant, 17th-century stately home is just the place. 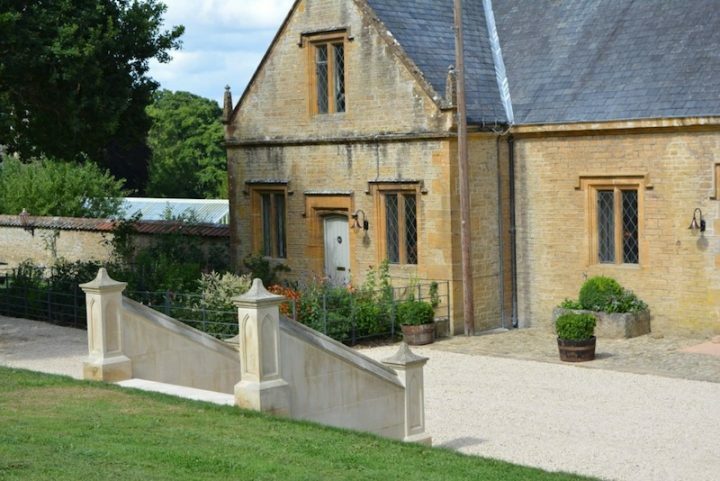 Formerly the seat of Lord Sherborne, and just down the road from the eponymous village, it’s nestled in the gorgeous Windrush valley between Burford and Stow-on-the-Wold, so you’re in topnotch Cotswold countryside, with 10 private acres to romp around in. There’s an indoor heated swimming pool, sauna and tennis court, your own private, cloistered courtyard and garden, and an orangery which would make the perfect setting for a proposal, indecent or otherwise. All in all, it’s the perfect romantic retreat – you’re not even allowed to bring babies or children. Not that you’d be tempted. 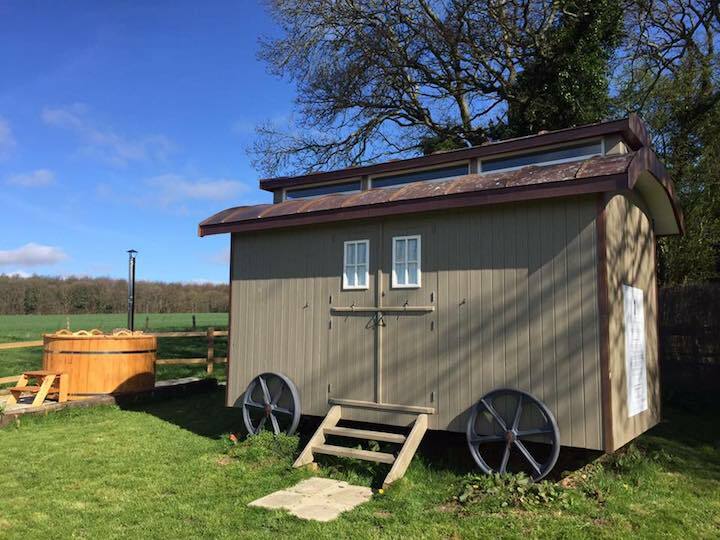 A glorious shepherd’s hut for those longing to plug back into nature without stinting on comfort: fluffy bathrobes anyone? Honeymooners, tired couples, walkers, authors, horse-riders (you can livery here), this is for you. 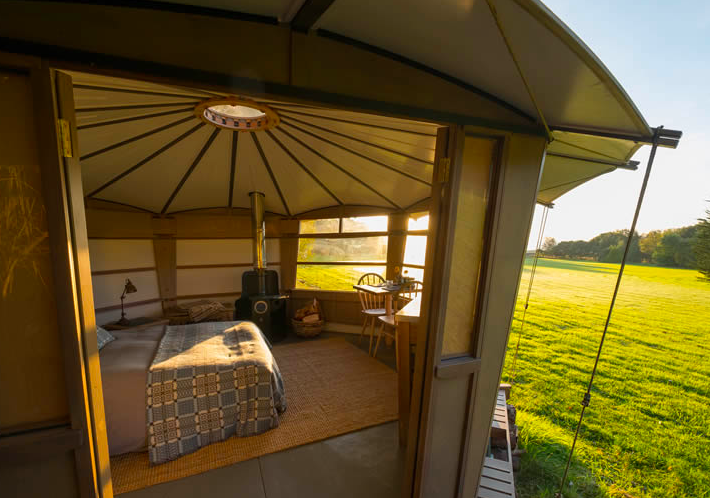 Set on a real-deal Hampshire farm with blue-dome skies, lark song and a galaxy of daisies stretching telescopic, the heated hut is spick in its cream, grey livery with a huge bed, Egyptian cotton sheets and a mini-kitchen and table. Outside there’s a Norwegian, wood-fired, hot tub where guests soak, lulled by smouldering cedar, blazing sunsets and a large glass of fizz. Tucked behind the living area, a magical outdoor bathroom in bluebell woods replete with hot shower and proper plumbing, there’s electricity in the hut as well. Owner and chef, Anna, provides home-baked supplies, including beef from the farm — throw it on the firepit or one of two bbqs, crack open a Merlot and enjoy. Sorry did someone say safari? We all love our other halves (most of the time! 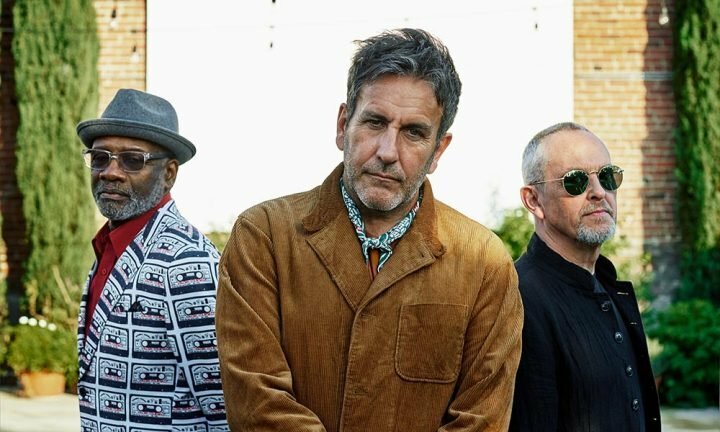 ), but let’s be honest, when we see them every night it’s fun to holiday with friends as well: a couple of nights just the two of you and a few nights with friends would be ideal. 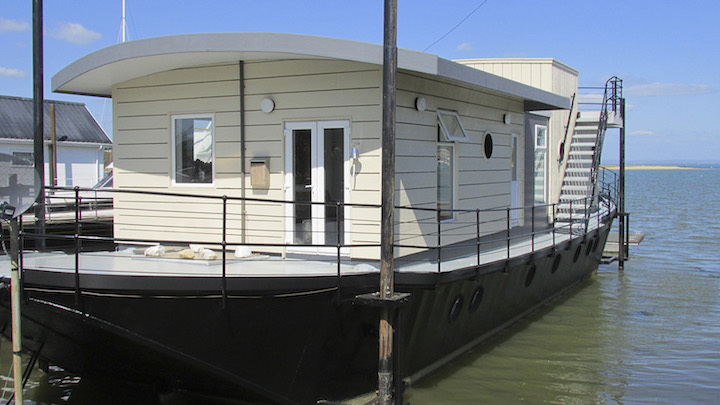 This is entirely possible on this reasonably priced Isle of Wight houseboat, with its luxe, roomy interior, two kingsize rooms plus two smaller bedrooms. Without a doubt Sturdy, for that is her name, oozes romance; in fact she is one of Country Living’s favourite UK romantic retreats. Once a 72 foot Thames Lighter, that’s a sizeable goods transporter to us know-nothing landlubbers, she is moored in a corner of the happily busy Bembridge Harbour. All mod-cons are accounted for: WiFi, a light-drenched, fully equipped kitchen, an open-plan living space and two modern bathrooms. The steel portholes and a zinc table top, tie-in with her industrial past but there’s also a strong nod to the white isle’s easy-breezy, nautical vibe: magnolia walls, faded wood, tide clocks, vintage globes and a top-deck picnic table, perfect for sundowners and yacht-spotting — the endless view stretches way out to The Solent. If it’s romantic, quirky escapism you’re after then roll up, roll up and step this way please. Just watch this clip of the setting for A Secret Garden (both inside and out) and you’ll see what I mean – it’s like entering your own little magical fairy-land, with stylish interior. 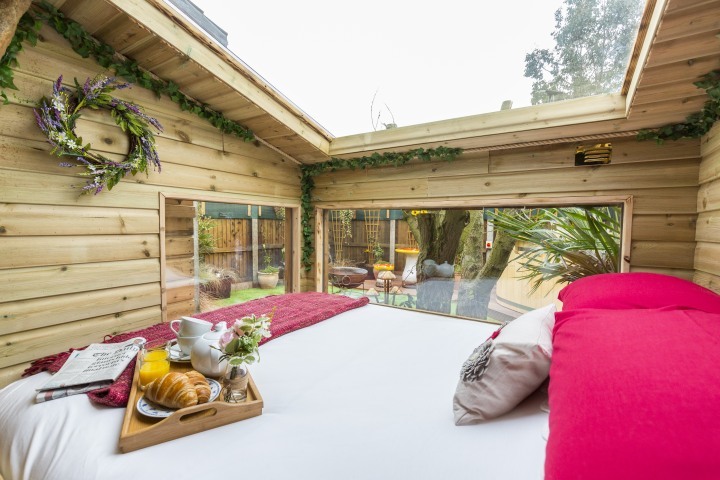 Kent Cottage Holidays (the guys that brought us the quirky luxury Treehouse Hideaway) have just opened another Whitstable wonder – this amazing small space for a glamping experience with a difference. Sleep in a comfy and cosy king-sized bed, tucked up into the framework of the pod which has amazing views from the glass roof and sides. Complete with a wood burner, and under floor heating, there’s also an under counter fridge freezer to keep your drinkies nice and cool and a barbecue. So you have the facilities to cook up breakfast, lunch or dinner – or if you would rather dine out, the local pub is just five minutes’ walk away. 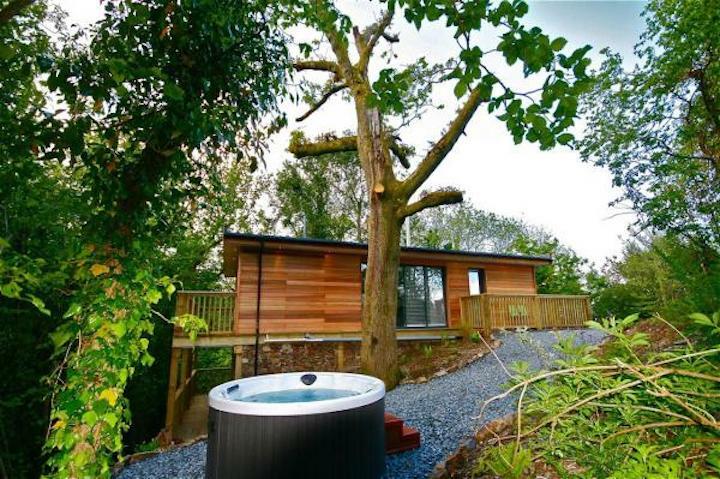 A stable door opens from the side so you can take a quick dash (in luxury towelling robes obvs) to the wooden two-person hot tub and sit gazing up at the stars whilst enjoying a glass of bubbles. 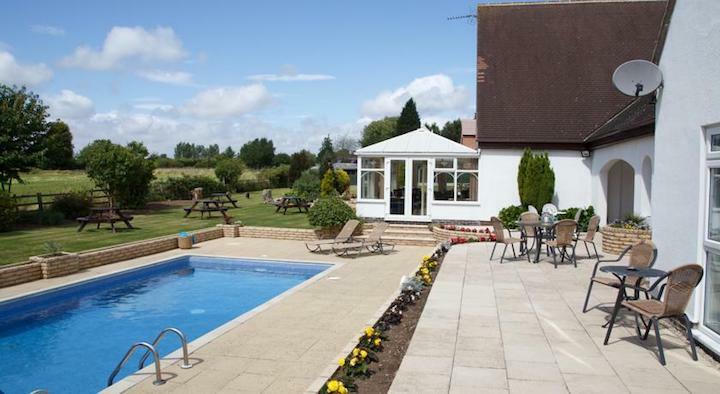 This super cute cottage offers luxurious country living and the perfect romanic break away. Located just outside the pretty village of Pluckley nearby you’ll find two good pubs within a mile, one renowned for its seafood and a lovely farm shop. Snuggle up close now because Pluckley is most famous for being one of the most haunted villages in Kent (good fun if you like that kind of thing!) This property has been furnished with flair giving a contemporary edge to the open plan living area. As well as a courtyard garden, there’s a cute covered loggia with seating, a wood burning stove and a copper bath that takes centre stage. The countryside is surrounded by apple orchards and you may recognise it as the location where the Darling Buds of May TV series was filmed. You can hop on the local train – just one stop to Ashford with fast trains to Canterbury and the Kent coastline. It doesn’t get much better than The Olive Branch, Rutland. Couples can tuck into Michelin-starred food over at the rustic restaurant prepared by chef Sean Hope where the focus is on top-notch pub classics with a culinary twist. Once done, head over to Beech House, a pretty Georgian building which serves as the hotel and is directly opposite the pub. Bed down in one of the six beautifully designed rooms, each one appropriately named after a type of food (to reflect the decor apparently). The Double Cream bedroom comes with antique furniture, cream decor (now there’s a surprise) and a luxurious roll top bath plonked in the middle of the bath errrr area. I say area because there is no ‘bathroom’ – it’s just one open plan room so ideal for romantic types. 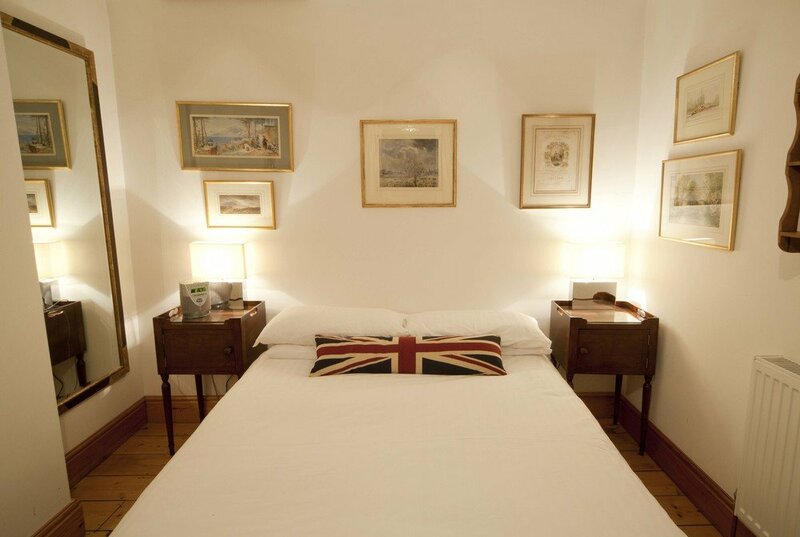 The beautiful bed comes with handmade pocket sprung mattresses, Egyptian cotton sheets and duck down duvets. Good luck trying to tear yourself away in the morning. This cosy family-run boutique hotel is set in 1.5 acres of landscaped grounds and is the perfect place for a mini romantic getaway. There’s only 18 rooms inside and the hotel has a lovely pool area (open now) and is a brilliant spot for some peaceful relaxation. Superior rooms come with crisp linen, plumped up pillows and super-comfy beds but the Field View apartment is one you’ll want to book; the French windows offer stunning views overlooking the Leicestershire countryside, an outside jacuzzi hot tub and a private terrace. Glen Watson runs the kitchen and has worked all over the UK including London’s Savoy so he knows his way around a kitchen. Tuck into rustic pub fare including fillet of cod, tomato fondue with parmesan herb crust. There’s nothing pretentious about this place, it’s just a great find with friendly service. Location, location, location, they say. OK let’s count… pad down to the bottom of the lane and enjoy a pint in the local, dog-friendly village pub (one), take a stroll on pristine – and quiet – Overy Staithe Beach (two) or head to Burnham Market – easily one of Norfolk’s prettiest villages (I should know, I’ve done the legwork) – a mere Hunter welly away, with its village green perfect for a cold one (head into The Hoste and ask for a plastic glass), chic art gallery, fabulous deli, and great pubs (three – and bingo!). Don’t leave without popping into the local fishmongers to buy some freshly-caught fish for the BBQ. 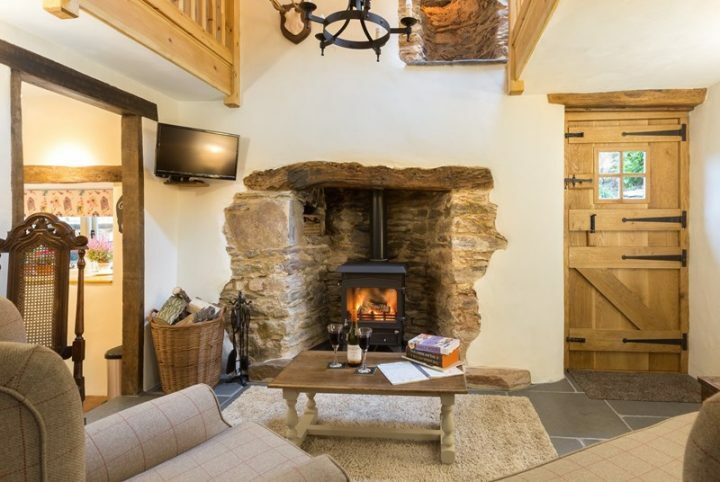 Sage Cottage itself is the perfect blend of modern and cosy with stylish wood floors, a large woodburner for toasting toes (or marshmallows), a breakfast bar, two bedrooms (one double, one twin) and a well-equipped kitchen. Sunny evening? Fire up the BBQ, grab that wine and sit on the patio. 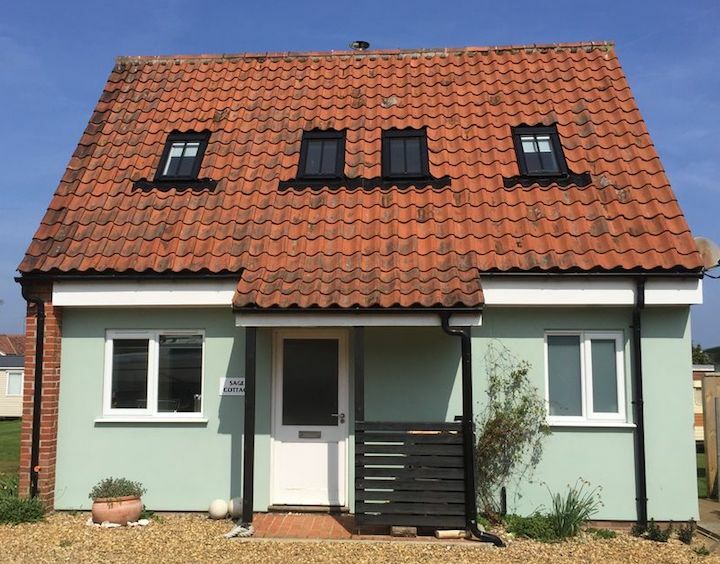 Set in the quaint village of Hickling, with its dog-friendly country pub and nearby beaches of Sea Palling and Happisburgh, Neaps is everything you’d want for a cosy weekend away with your beau. A one-storey country-style property, it’s both stylish and functional with a newly-fitted kitchen, decent-size double bedroom, modern shower room, and lounge with soft sofa, games and DVDs. There’s also a wood burner for cosying up come evening – logs are provided on an honesty policy; simply put your money in the ‘honesty rabbit’ on the sideboard and light away (we love it!). Decor, meanwhile, is country chic – all tongue-and-groove and duck-egg blue. The property’s pretty porch (great for storing muddy wellies) leads to a larger-than-average, immaculate south facing garden (a rarity with smaller cottages) with seating and a BBQ – perfect for enjoying a meal or cold glass of wine on a sunny evening. Secure hedging and fencing ensure that pooches are safe to explore to their heart’s content. 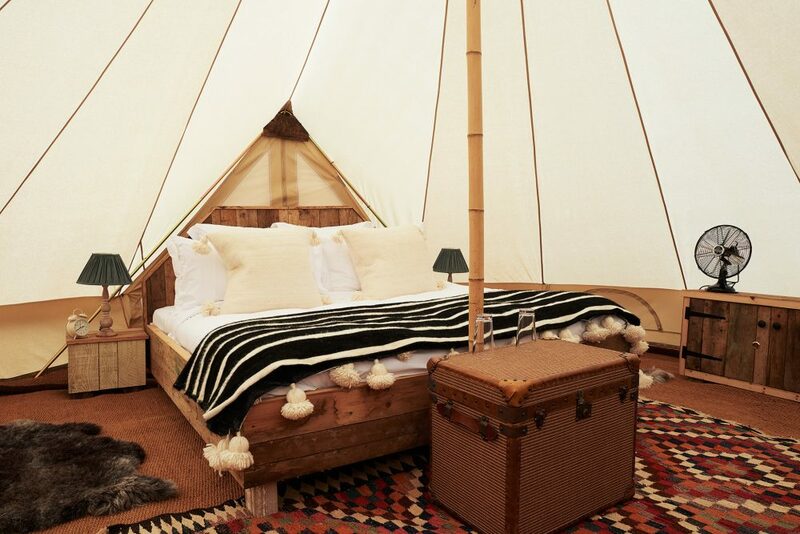 Yes you could stay in a fancy pantsy lodge at Soho House’s superstylish Oxfordshire outpost, but roughing it – comparatively of course – in one of the bell tents is a more romantic, non? You have all the accoutrements you’d expect from Farmhouse, like supersoft nightgowns, pillows galore, woodburning stove and throws that have been hand-knitted overnight by Nomads flown in from the Sahara (or something). You can clean your teeth and make a cup of tea in the artfully corrugated outdoor sitting room, and sit outside trying to spot someone famous who is ‘slumming’ it. Be warned that toilets but that’s what the back of tents were made for! Soon as I saw this place I thought of Lady Chatterley’s Lover – perfect for a romantic weekend or longer, even if your other half isn’t a gamekeeper. 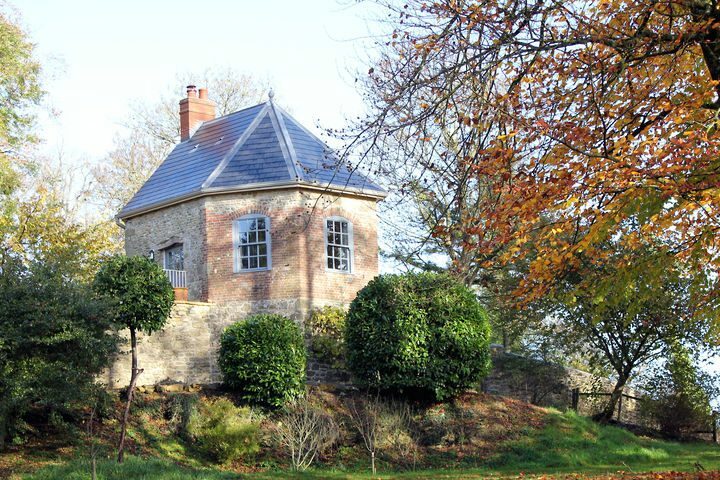 Set in the grounds of a spectacular Jacobean manor house in south Somerset, this early 18th cottage is all golden hamstone period charm on the outside and quirky, contemporary décor once you’re through the front door. Aside from the luxurious double bedroom and bathroom, there are two sitting rooms, one with an open fire (all kindling, coal and logs supplied), TV/DVDs and a well-equipped kitchen/dining room with a range cooker. Out through a stable door you’ll find a private terrace area and choice of gas or charcoal BBQ. The cottage has its own pretty herbaceous garden but it overlooks the working vegetable and flower garden of the main house – think espaliered fruit trees and photogenic rows of veg and blooms for cutting. Take a stroll in the orchard and parkland or fish in the half-mile-long river Yeo meandering through the 60 acres. If you can drag yourselves away, the market town of Sherborne (historic abbey, a castle, independent shops) and the Jurassic coast are close by. Perfect, m’lady. What could be more romantic than a getaway for two in the heart of England’s largest vineyard? Denbies Farmhouse B&B offers peace, prettiness and of course wine. 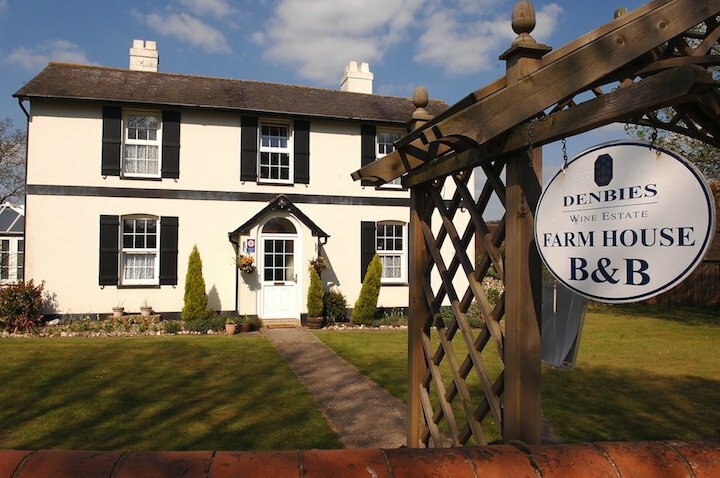 The original farmhouse has been refurbed and there are seven double ensuite rooms here, with a full English breaky served in the conservatory overlooking the gardens and the 265 acres of vines. While on the wine estate, you can dine in either the Gallery Restaurant with panoramic views out across the estate, or the Conservatory Restaurant for a less formal or alfresco option. And while you’re at Denbies, there are winery tours as well as tasting experiences. 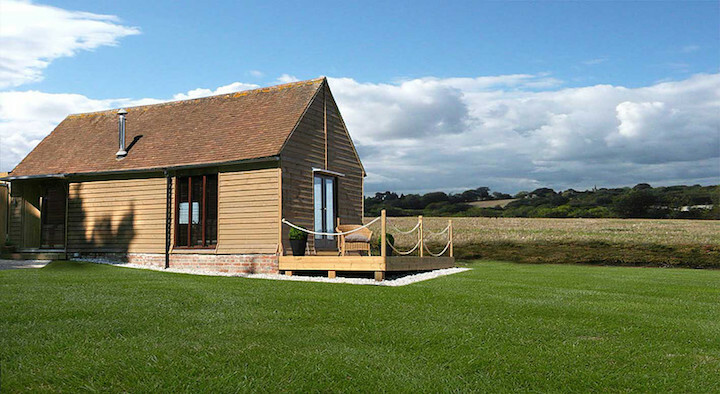 For a little a slice of getaway-from-it-all peace, not far from lovely heritage town Rye, consider this unique standalone studio with its own deck and lawn, overlooking fields. There’s a roomy sitting area, a smart en-suite and a handy kitchenette for preparing picnics and keeping your wine chilled. In the morning you’ll take a tree-lined path to enjoy a full breakfast served in the owner’s gorgeous 15th century thatched cottage. When you’re not sightseeing, you can use the tennis court on request. At night, huddle together and look out for shooting stars. Knelle Dower was a Muddy Awards finalist in 2016 so you know it’s got a lot of Sussex fans! 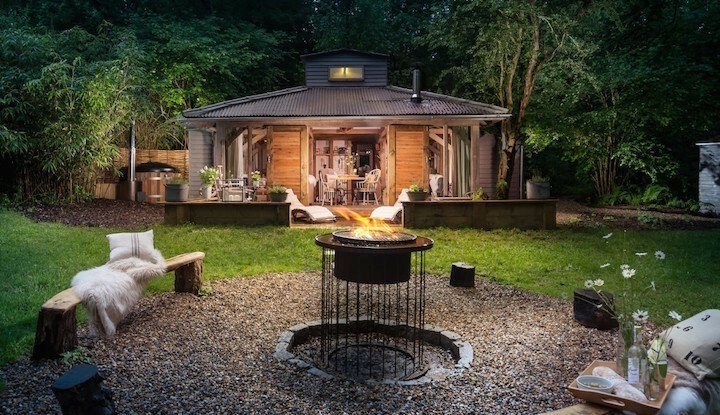 Snuggle up in this secret cabin hideaway with its own eco hot tub and fire pit in the heart of the Weald Downlands. You’ll be surrounded by a wildflower meadow, an organic garden, and ancient woodland that is full of bluebells in spring. It’s digital detox territory with no wifi or TV and though there’s there’s an oven, fridge and microwave, for a real romantic getaway you can raid the welcome hamper and order in chocolates, champagne, even caterers. Spa therapists too can come calling at your request. And if you fancy getting all back-to-nature you can take a bushcraft course to forage for your food! 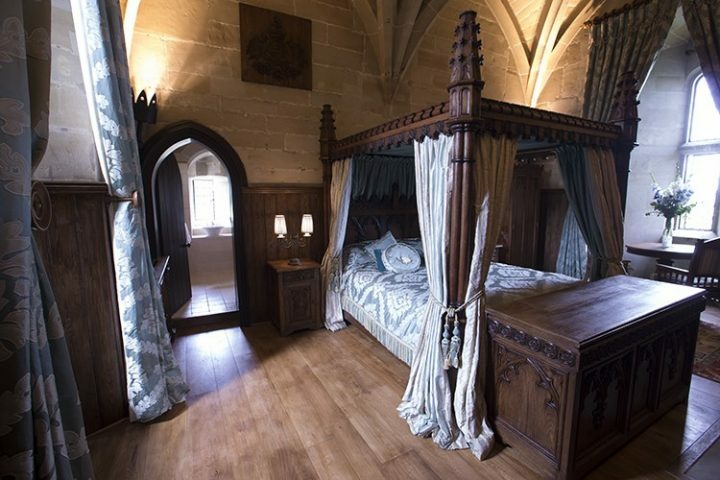 Ever fancied sleeping in your own Game of Thrones-style private chambers in a 14th Century castle tower? No not Winterfell, but Warwick Castle. On days out here I’ve often wondered what it would be like to stay the night – and now you can. Pretend to be Daenerys Targaryen or Sansa Stark – Warwickshire’s own Sophie Turner – in your own Tower Suite. There are two to choose from: The Peacock or The Rose. Think ornate high-vaulted ceilings, mediaeval inspired furnishings, rich tapestries and King-size four-poster beds with contemporary en-suite facilities. Can’t you just see Jon Snow sprawled across this four-poster in his black winter furs and breeches? 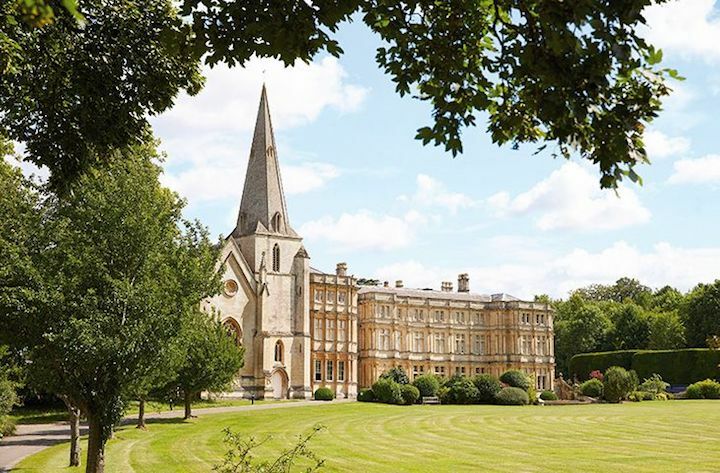 You can expect champagne on arrival, breakfast, a private Castle tour and two days’ priority access to the Castle attractions and 64-acres of gardens overlooking the River Avon. ‘If you go into the woods tonight, you’re sure of a big surprise’… No, not a teddy bear’s picnic but a romantic octagonal folly. And the real surprises lie inside. The ceiling and walls of the main bedroom are decorated with garlands of real shells, while in the basement is a cavern-like cold plunge pool brrrr! 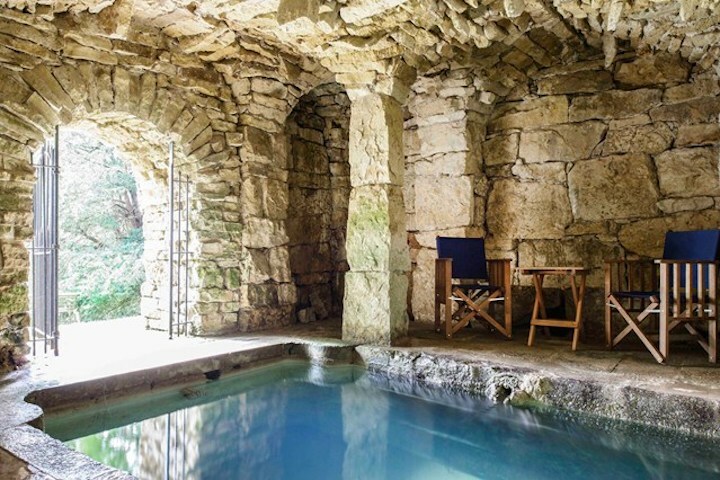 – your very own 18th century spa (see top photo). Described as ‘The Poshest bedsit in Warwickshire’, The Bath House is rich in history and was fully restored between 1987 and 1991 by the Landmark Trust. It’s close to Wellesbourne and 20 mins from Stratford-upon-Avon at the end of a long and gated drive with views across a valley and woods. 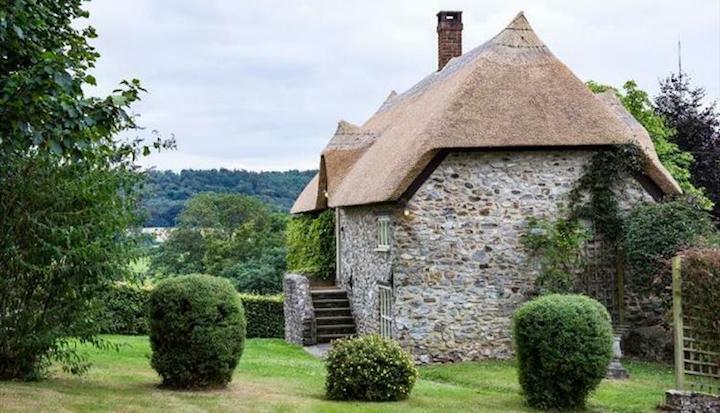 Channel your inner Sleeping Beauty with a stay at this utterly, utterly gorgeous pied a deux in the idyllic village of West Overton, a quirky 17th century gaff with spindly staircases, dreamy master suite and fairy-sized snug. There is only one bedroom (but that’s kind of the point, isn’t it?) and although children are welcome in a zip-and-link you don’t really want to bring them, right? High tea can be taken in the garden on clement afternoons and when winter casts its frosty spell Fairie Door becomes a cosy haven. You’re a mere stone’s throw from Marlborough with its boutique shops and fab Rick Stein’s when you get bored of, um…staying indoors. But you won’t, here. 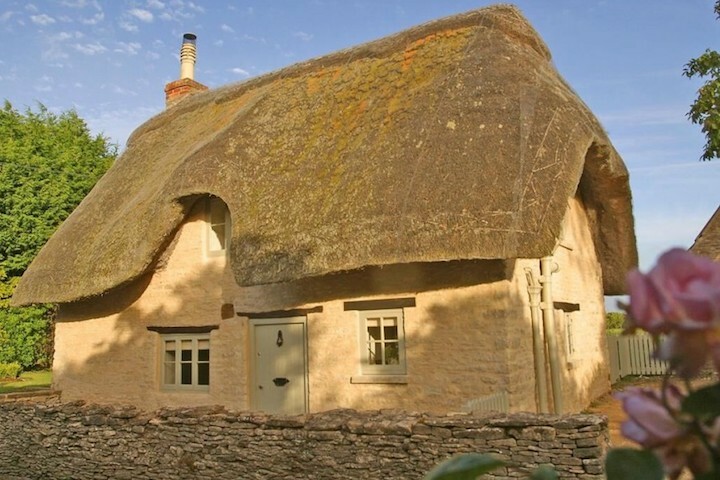 Thatched with golden wheat straw and sprinkled with magic, Faerie Door Cottage is a pot of gold at the end of the lane, plucked straight from the pages of a story book. And honestly, what can be more romantic than that? At the end of a romantic tree-lined avenue, once the drive of a large country house, lies this enchanting little folly. Built in the 19th century as an observation tower for the ladies of the house (yep, that’ll be me) to watch the Hunt over neighbouring fields , the building has been painstakingly restored to provide an unusual, tranquil and mind-blowingly romantic setting for that veeeeery special weekend. It’s got a spiral staircase, natch, gallery bedroom with kingsize bed and is perfectly placed to explore Stourhead, Salisbury and Stonehenge. There’s also a plethora of fab pubs on your doorstep but this is a romantic weekend so you’re not going anywhere, right? Inspired by American transcendental poetry and its love of nature, and showcasing the best of Welsh arts and crafts, Hide at St Donat’s offers a range of unusual and stylish accommodation on the Glamorgan Heritage Coast. Hide has three romantic, snug Cabans tucked between trees, bushes and wildflowers offering uninterrupted views of the wild seas. Your hosts, Paula Warren and Tom Parker make the unique wooden Caban studios, which sleep two adults enabling you to live truly close to nature. Each has plenty of space with its own terrace, separate private bathroom and kitchenette. Striking coastal and countryside walks are on Hide’s doorstep, while guests can enjoy beautiful views across the Bristol Channel to Somerset and the north Devon coast. Historic buildings and museums are close by, including St Donat’s Castle and the internationally-renowned Atlantic College.